When it comes time for your child’s first haircut, it is very normal for the parent to feel apprehensive, as well as the child. Some parents think that they can just breeze into the barber shop without any practice beforehand, however this is not the case. Your barber will do his best to keep your child calm and under control, however all kids respond differently to scissors and haircuts all together. Before heading to the barber shop for the first haircut, it may help to follow these simple tips to make your kid’s haircut as smooth as possible. Get your child prepared for process – Whether it be watching a video of a haircut or cutting a Barbie dolls’ hair, show your child how easy the haircutting process really is. Find an unpopular time to go – Find a time of the day that will be the slowest for the barber salon. Sometimes the child only gets upset because of all the people around them. 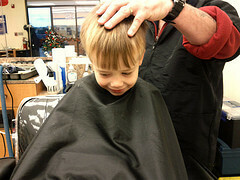 Ask the barber to show the child the supplies he will be using and walk him through the process. This could turn it into a fun experience rather than a dreaded one. Make sure they nap and eat – Bringing your child into a barber shop hungry or tired is never a good idea. Bring a special friend – Allowing your child to pick a friend (real or fake) with them will help ease their fears. Don’t allow your child to bring more than one friend though because you don’t want to overwhelm them. For your child’s first haircut, come see us at Dave’s Barber in Woodstock, GA. We will help your child feel as calm as possible and give a great first haircut.